There’s nothing more heartbreaking and frightening than discovering your cat needs medical care that will cost hundreds or even thousands of dollars. If you need help with vet bills, these charities might help. Getting a grant from a charity to help with vet bills isn’t always easy, but it can be done. Just be sure to read the guidelines carefully to make sure you qualify before you apply. Some organizations will require a written prognosis from your vet before giving you money, and many will expect you to chip in with your own resources. These are some of the charities that help with vet bills when money is available. If fund raising is slow or the demand is high, the group might not have money for you, at least not right away. And many of the grants are very small, so be prepared to ask for help from more than one organization. This list was current as of March 2018. American Veterinary Charitable Fund makes grants to veterinarians providing direct charitable care to clients’ animals. Ask your vet to apply on your behalf. Blue Buffalo Foundation funds companion animal cancer research and provides some resources for help with vet bills on its website. Care Credit is a low-interest credit card that can be used for veterinary care. You might get a higher credit limit if you apply through your vet. Dylan’s Hearts helps low income families whose animals have a life-threatening illness or critical injury. Your veterinarian must apply on your behalf. Kobi’s Fund For VAS Cats assists people whose cats have vaccination site sarcomas. Scroll down to the bottom of the page to see whether you might be eligible and find the application. Paws 4 A Cure helps with all kinds of veterinary expenses except spay/neuter, vaccinations and other routine care. Red Rover provides small grants to people who can demonstrate financial need and whose animals are in need of urgent and specific medical care. Rose’s Fund For Animals helps animals with life-threatening conditions who need immediate care and have a good prognosis. Your veterinarian will have to contact the Fund for you. Scratchpay is low interest loan program for companion animals’ vet bills. Shakespeare Animal Fund helps older adults, people who are disabled and those whose income does not exceed current poverty guidelines pay for emergency veterinary care. The Murphy and Sugar Foundation helps with veterinary office visits, testing/diagnostics and medications as needed for income-eligible people who would otherwise not be able to care for their critically ill companion animals. The Onyx and Breezy Foundation can help with medical hardship. The Paws For Love Foundation funds medical care for companion animals in rescue. and beyond normal care. Because of long wait times the organization can’t fund emergencies. Payments are made to veterinarians who must be approved by the program. The Pet Fund pays for treatments that are above and beyond normal care. Because of long wait times the organization can’t fund emergencies. Payments are made to veterinarians who must be approved by the program. Wells Fargo Health Advantage credit cards work much like Care Credit. Cutting costs without compromising quality of care can also help with vet bills. Give some thought to these suggestions. Many spay/neuter clinics also offer other low-cost veterinary services. Think about having your cat’s annual wellness exam done there to save some money. Just say no to vaccinations. They’re expensive. And research shows that after their kitten shots and boosters, cats don’r need “annual shots,” especially if they stay inside. Refuse prescription food. It, too, is expensive and doesn’t provide adequate nutrition for your cat. You can achieve the same therapeutic benefits — low carb, low in phosphorous, preventing bladder stones and crystals, help with weight loss — by tweaking your cat’s diet. Ask an email list or Facebook group specific to your cat’s condition for help. If you do decide to use prescription food, ask your vet to call a prescription in to an online retailer. It will be less expensive that way. Do it yourself. If you have a diabetic cat, learn how to home test so you can avoid having those costly blood glucose curves done by your vet. To make vet care affordable for your cat, learn to do fluids and other simple treatments at home, too. Use your own pharmacy for your cat’s meds. They’ll be considerably less expensive than they are when you get them from your vet. And many pharmacies will let you use your prescription discount card when buying medicine for your cat. There are also discount prescription drug plans for cats. Here are some tips for giving your cat pills. Use a Canadian pharmacy if your diabetic cat is on human insulin. It will be much more affordable, especially if you buy pens instead of vials. 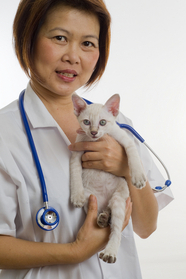 Get a second opinion if your cat’s treatment sounds prohibitively expensive. Another vet might provide the same services and quality of care for less. Set a budget. If you tell your vet you have only a certain amount of money to spend, he’ll probably respect your limitations and won’t suggest treatments he knows you can’t afford. If he’s ungracious or tries to make you feel guilty, find another vet who’s understands your financial constraints. Don’t take shortcuts. Have all the diagnostics done at once so you’ll know your cat is getting the correct treatment and you won’t have to pay for a second vet visit when he’s not getting better. If your cat needs surgery or has a serious condition, ask for a referral to a specialist. Specialists don’t charge much more than regular vets and getting it right the first time will save you money in the long run. Never try to diagnose and treat a health problem yourself. Correcting mistakes can be expensive and could cost your cat his life. Plan ahead. Consider pet insurance for your cat, but read all the fine print to make sure the plan covers everything that’s important to you. Or start a savings account specifically for your cat’s health care. Another possibility is to have a high-limit credit card that you use just for vet care. While there are discount veterinary care plans, they often turn out to be just as expensive as insurance. Keep up with the latest treatments. Again, you’ll spend less money in the long run if your vet gets it right the first time. But few vets are able to keep up with the latest treatments for every disease they treat, so do some research and be prepared to ask questions and make suggestions. A disease-specific email list or Facebook group can help you with this. Keep your cat healthy. A species-appropriate all-wet-food diet, minimal or no vaccinations and a stress-free lifestyle are just a few of the ways to avoid costly chronic diseases like diabetes, irritable bowel disease and bladder stones and crystals. Most rescue groups need to conserve their limited resources for the cats already in their care, but a local group might be willing to fund-raise for you to help with vet bills or assist you if you try fund-raising yourself. Facebook is a great place for fund-raising, especially if a rescue posts for you on its fan page.